Hey friends! I have a quick patterned paper card I wanted to share with you today! Recently I was using some pretty 12x12 paper with a lovely bird and flower pattern and I wanted to keep a piece of it as a focal point. I decided to use it right on the front of this pretty spring card, and by only adding minimal embellishments I created this pretty card in only about 10 minutes! After layering my patterned paper panel over a piece of purple paper I added a couple pieces of pretty washi tape and some Bold and Bright sequins from the 28 Lilac Lane collection. These sequins are amazing! I used some word stamps to add one more element to my card and it was done. I love how the paper already had glitter on it! Thanks so much for joining me today! I hope you enjoy a lovely week, with a bit of crafty time thrown in! FCCB #273 - Farm Animals! For my project this week I've created a scrapbook layout using the 4th sketch from the Ready Sketch Go class that I've been thoroughly enjoying, and my Cricut for my title and farmyard diecuts. I wanted my title, cut from the Country Life cartridge to stand out a bit more so I layered it on a yellow oval, which I added to some paper strips and a fun country sticker. These cute buttons are from May Flaum's new embellishment line - 28 Lilac Lane, from the Tropical Twist set. These sets are soooo awesome! I used some woodgrain and script papers to cut my fence and then used some Distress Ink to add highlights to the cuts. The fence and haybale diecuts are from the Old West cartridge, and the rooster is from the From My Kitchen cartridge. These were easy to lay out in Design Space to get the correct size and then I coordinated my colours. Thanks so much for stopping by today! I hope you had a lovely Easter and enjoy a wonderful week ahead. Don't forget to stop by the Fantabulous Cricut Challenge blog to see what all the other Design Team members have come up with for this fun challenge - and enter your own project with a Cricut cut for a chance to win a fabulous prize from Verve Stamps! I hope everyone enjoyed a very lovely Easter! 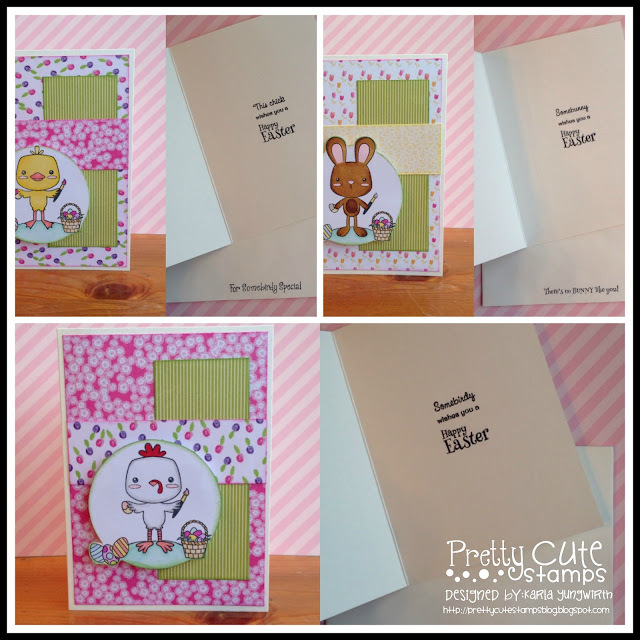 Our family is having Easter dinner today, so I thought I'd share these cute cards I made for my daughter's preschool teachers using the adorable Easter Cuties stamps from Pretty Cute Stamps! I used some pretty spring papers as my background and layers and then stamped my images on white cardstock circles before colouring with alcohol based markers. I masked some of my images and fussy cut around the parts that extended outside the circle. I just hand drew in a line for the grass and added a bit of marker shading. The little paintbrush is from the School Planner stamp set, which was just the perfect size for these cuties! I always love finding new ways to combine elements of the stamp sets that I have. There are a few more small icons in these planner sets that would also be perfect accents! 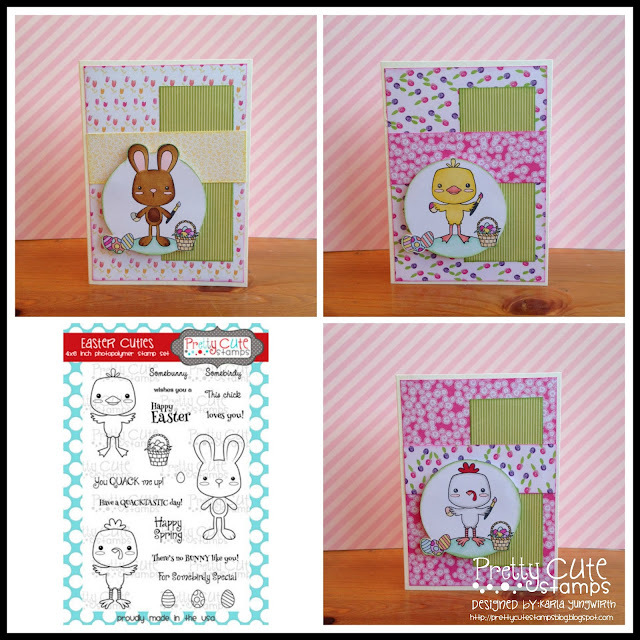 Here I used the mix and match sentiments in the Easter Cuties set to decorate the insides and envelopes of my cards. My daughter was very excited to give these to her teachers! I hope you are enjoying your Easter Monday! Be sure to check out all the fun inspiration at the Pretty Cute Stamps blog - along with our current challenge, Anything But A Card! PDE Friday Linky Party - Hand Stitched Felt Owl! I'm sharing this adorable stitched felt owl over at the PDE Linky Party blog today, and I just had to share the details with you! I actually found a pattern I had printed out a very long time ago and decided to use it to make this cute owl for my sister at Christmas time. I totally think this sweetie could be used as a tag, decoration, or on a gift at any time of the year though! I was really excited to actually find the website where I downloaded the pattern from originally so that I could share it with you! You can find it here from the Juicy Bits 131: give a hoot blog post. I cut the felt and then handstitched it together. Since it's so little it really goes together very quickly. There's something so relaxing and therapeutic about sitting down and handstitching! I actually used black brads for the tiny eyes. Thanks so much for joining me! 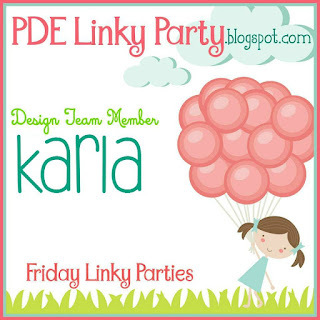 I hope you'll stop over at the PDE Linky Party blog to see what the other Design Team members have come up with this week, and since it is always Anything Goes, please share your crafty projects with us too! I am so loving my Distress Crayons! Here's a look at a card I made to share on the Scrapendipity Way Of Life blog today. I used the white Distress Crayon and a circle stencil as a resist on this card. After stenciling on my white card base I sponged on Distress Inks and then used some Tim Holtz stamps to stamp over top. I love the way the Crayons resist the inks! I used my Inks again to colour my seam binding ribbon (Selena can order this in for you!) so it blended perfectly with my card. A little paper flower in coordinating colours and a couple heart sequins finishes it off. Thanks so much for stopping by today! I hope you have a wonderful, warm spring week. 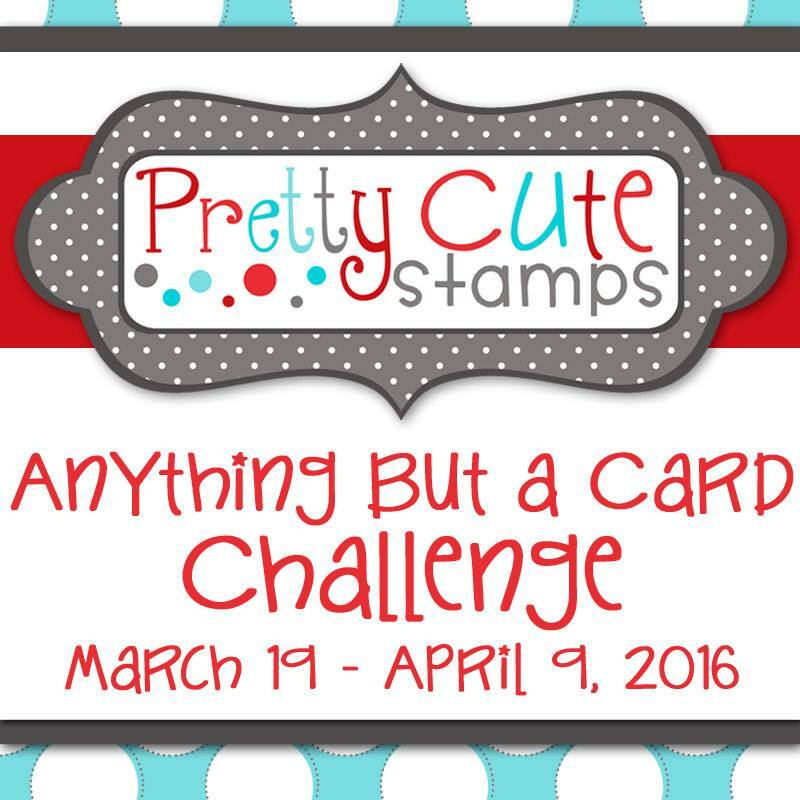 Pretty Cute Stamps March Challenge - Anything But A Card! I really cannot believe March is over half over! It seemed like we were getting an early spring, and then this week - eek - snow! I know it won't hang around too long, but I'm ready for warmth and sunshine! 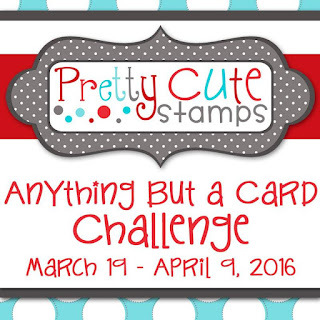 The great thing about this week, though, is our March Challenge over at Pretty Cute Stamps! This month the challenge is Anything But A Card. The sky is the limit! Tags, boxes, bags, wall art... we'd love to see what you do with this challenge using a Pretty Cute Stamp! I've chosen to make a gift card holder, which I gave to my husband for his birthday. I cut the Basic Gift Card Holder 1 Cutting Files from Pretty Paper Pretty Ribbons with my Cricut Explore and used the Jawsome stamp set from Pretty Cute Stamps. I used some fun sentiments from this set both on the outside of my gift card holder as well as inside (see below) A few foam dots pops up my scalloped circle to add dimension. I used Prismacolor Markers to colour in my image, which I stamped on the circle diecut. 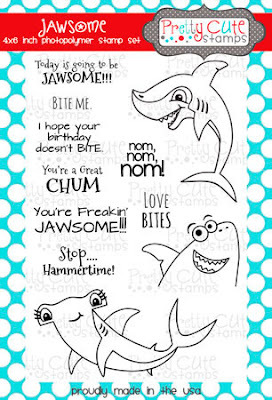 Behind the gift card I stamped the 'You're Freakin' Jawsome!!' sentiment. I used the write feature to write Happy Birthday on my gift card holder and added some fun sequins! Thanks so much for stopping by today! Be sure to head over to the Pretty Cute Stamps blog to see what all the other Design Team members have come up with, and enter your own project for a chance to win a fantastic gift card! I have one more crafty project to show you before St. Patrick's Day! Today, I'm sharing this framed subway art project I made using my Cricut Explore and the Word Collage cartridge. I changed the lettering to 'write' and then cut some of the words out in different patterned papers. The other words I used markers and paints to colour in. I love the way this turned out! I had a gold frame I wasn't using so I put some glitter tape on each end of the art before placing it in the frame and then added some pretty green toned flowers. Because I wrote the lettering first I had no problem placing the diecut letters in the proper place. Here's a look at my little St. Patrick's Day display! You can see the post where I showed this fun St. Paddy's diecut basket here. Thanks so much for stopping by! I hope you enjoy a lucky St. Patrick's Day this week! I've had fun this year crafting a bit more for St. Paddy's day, and this pocket letter is something I created to send to a friend! I used my Cricut Explore to cut lots of St. Patrick's Day images from, which I layered on some pretty background papers. The Rainbow stamp and sentiment is from Pretty Cute Stamps, and I added sequins, glitter tape and gems to add some lucky shine! I had two pieces of St. Paddy's paper in my stash, and other than that just combined green patterns with diecuts to create this fun pocket letter. How cute is this leprechaun from the Simply Charmed Cricut cartridge?! You can see another project I used his 'brother' on here. The Spring Holiday Cards cartridge worked perfectly to cut into just the right size to fit in my pockets. They would also work for a Project Life page! I cut the pot of gold from the St. Patrick's Day cartridge. By using a piece of cardstock that already had a black distressed pattern on it I created a neat look for my pot. On the back I added some diecuts, flowers, stamped images from the new Pretty Cute Stamps release, glitter tape, gems, a note about myself, sequins, LUCKY STARS and doilies! Lots of fun goodies for my pal! Thanks so much for stopping by today! Wishing you a very lucky week! Rainbow Gift Bag and Mini Notes! I have been so excited to get to play with all the amazing Spring themed stamps that came out with the March Release last week at Pretty Cute Stamps! If you haven't checked out the awesome blog hop be sure to click here for details. Since the New Release stamps are ON SALE until March 15th I just had to share another project using them, as well as the sweet Rainbow Gift Bag diecut project that Lisa created for this release! 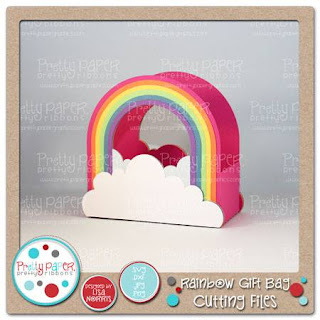 I decided to create six mini 3x3 note cards to fit inside my Rainbow Gift Bag. Since I was on a rainbow roll ;) I made each card a different colour of the rainbow, layered some coordinating patterned papers and then a piece of white cardstock. 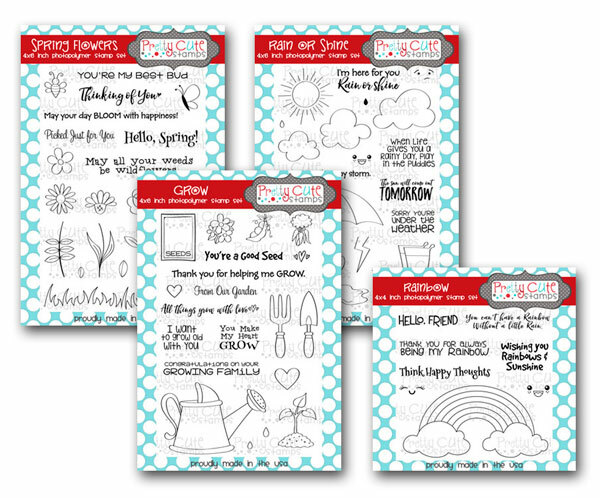 I used stamps from each of the four new stamp sets - Grow, Rainbow, Spring Flowers and Rain or Shine. I used alcohol markers and paper piecing to colour in my images and then chose a coordinating sentiment to put on the inside of each card. I stamped a little bee and butterfly on the envelopes for each note card, which I made with my We R Memory Keepers 123 Punch Board - love! I stamped a different sentiment on each side of my gift bag before popping up the outer clouds to give dimension. You can see the other sentiment in the first photo. I put my cards inside the envelopes and tied them with some pretty white ribbon, ready to give as a gift to a friend or teacher! And a look at the New Release stamp sets! Thanks so much for joining me today! I hope you have a lovely, crafty week! Look At This Awesome View! I'm loving the online scrapbooking class Ready, Sketch Go and wanted to share my 3rd sketch from the class! I've been hoarding these Capture Life viewmaster stickers, alphas and paper for just the right layout and I finally got some great photos that were perfect for scrapping with these lovely embellishments! I wanted to try an experiment and used the write feature on my Cricut to journal!! I used one of the new Signature fonts and then cut the cardstock into strips to add to my layout. This Tim Holtz viewmaster diecut is one of my favourites. I layered a piece of black cardstock under it to make it look like the real thing. Thanks so much for joining me today! 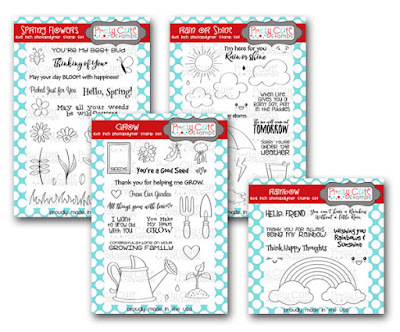 I hope you'll check out the Ready Sketch Go class if you'd like to make more scrapbook layouts. It is really amazing and there is even more inspiration in their FB group! Wishing you a happy, crafty week! Pretty Cute Stamps March 2016 Sneak Peek! Pretty Cute Stamps Sneak Peek Freebie! Scrapping Everyday Miracles March Challenge!